One night before putting him to bed, Enaiatollah's mother tells him three things: don't use drugs, don't use weapons, don't steal. The next day he wakes up to find she isn't there. They have fled their village in Ghazni to seek safety outside Afghanistan but his mother has decided to return home to her younger children. Ten-year-old Enaiatollah is left alone in Pakistan to fend for himself. In a book that takes a true story and shapes it into a beautiful piece of fiction, Italian novelist Fabio Geda describes Enaiatollah's remarkable five-year journey from Afghanistan to Italy where he finally managed to claim political asylum aged fifteen. His ordeal took him through Iran, Turkey and Greece, working on building sites in order to pay people-traffickers, and enduring the physical misery of dangerous border crossings squeezed into the false bottoms of lorries or trekking across inhospitable mountains. A series of almost implausible strokes of fortune enabled him to get to Turin, find help from an Italian family and meet Fabio Geda, with whom he became friends. 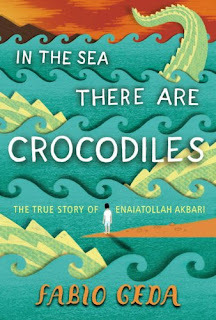 The result of their friendship is this unique book in which Enaiatollah's engaging, moving voice is brilliantly captured by Geda's subtle and simple storytelling. In Geda's hands, Enaiatollah's journey becomes a universal story of stoicism in the face of fear, and the search for a place where life is liveable. This book was very different from what I usually read and was quite an eye opener. 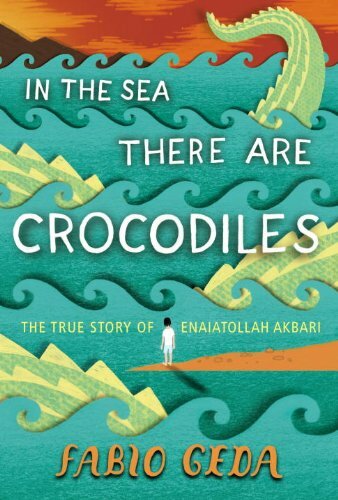 In the Sea There are Crocodiles follows the story of Enaiatollah a young Afghan boy who is left at the border of Pakistan one night by this mother and tell of his journey around and through various European countries as he tries to find somewhere where he can settle and live without persecution and having to work and live in horrific conditions. The book really opens your eyes to how some children (Enaiatollah is between 9 and 16 in the book) have to live through. He works all hours doing nasty jobs for very small wage just to be able to scrape enough together to feed himself. The journey's he endures between the places he travels are simply awful. The stories of his trek over the mountains and how he traveled in the bottom of a van are unbelievably heart breaking. What was quite nice though on the other hand is seeing how his story played out in the end as there are several bits where he is helped out by individuals solely out of the goodness of their hearts which was really uplifting and the way he viewed his education once he finally got settled was also very sweet. The only thing I didn't like was that the story was broken up midflow at times where the author interjected a question to the boy telling his story. I didn't like that bit of it as i thought it messed up the pace of the story and made it feel like a transcript of an interview. That cover is stunning! High five to the illustrator. Thanks so much for highlighting this - an immediate add to my TBR. Sounds like an unusual and interesting read. Fantastic cover art too! Those interjections made by the author in my opinion serve a very important purpose. They act as a stark and constant reminder to the reader of the very biographical roots of the novel and the connection between author/character. They also serve as very interesting food for thought, the author often questioning Enaiat on very specific aspects of his story.